A passerby stopped with the woman and had to pay the fine. 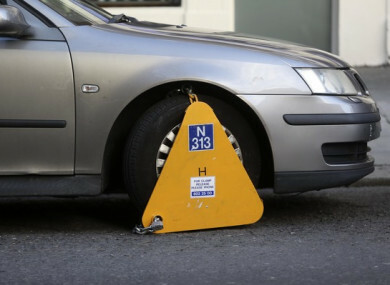 AN ELDERLY COUPLE had their car clamped for being parked in a disabled parking bay in front of their house, despite the husband having Parkinson’s disease and a Dublin City Council Residence Permit being displayed in the vehicle. The couple claimed, in a complaint to the Council, that they were told by gardaí not to leave their disability permit visible. The warning came, they said, after the car was broken into and the permit was stolen just a few weeks previously. In another instance, an elderly woman was clamped while at mass and didn’t have a mobile or credit card to deal with the situation. She had to rely on a passerby to assist her, and arrange for the clamp to be removed. Last month, TheJournal.ie revealed the most common areas and offences that Dublin City Council (DCC) receive clamping complaints about. From May 2016 to May 2017, the council recorded 63 complaints about clamping on its appeals system. A number of them led to refunds or partial refunds. We’ve looked at the recurring themes of these complaints. Namely, pay machines being out of service, tickets being turned upside down because of windy weather, and a few cases of clamps not being put on properly. Today we’re examining cases of elderly people who were clamped, based on information received under a Freedom of Information request to the council. In the case of the couple who were clamped even though their car was parked in a disabled bay outside their home, the woman told the council that the vehicle had been broken into recently and her husband’s parking permit stolen. She added that gardaí told her this is “happening all the time now”. The gardaí specifically told us not to leave this permit visible in the car anymore as it will be broken into again and the windows all smashed again. Myself and my husband are elderly and we can’t afford to have our car windows smashed again or indeed afford clamping fees. The letter, dated 12 May 2017, states that copies of four letters were sent to Dublin Street Parking Services on 29 March, 10 April, 20 April and 29 April but that they all went unanswered. We can’t use our Dublin City Council approved disabled parking bay now for fear you will clamp us again, instead we park up the street and away from our house which isn’t acceptable. What is to be done going forward? A spokesperson the gardaí said they were “not aware of the issue” when asked if they knew anything about parking permits for people with disabilities being stolen from cars. In the complaint by the elderly woman whose car was was clamped while she was in mass, the female passerby who came to her assistance wrote to the council to make a complaint. She explained that prior to the event she “had no connections with the lady in question”. I happened to be passing along the street on the cold morning of 23 October when I observed the elderly lady in a state of confusion and distress. The complainant said that she feared for the wellbeing of the woman and “had no option but to pay the fee for her with a view to explaining the situation to DSPS as soon as it was possible to engage with a living member of staff”. However, she explained that she had received a response to her original appeal and that she was ”appalled by the inhumanity demonstrated”. The woman added that it “utterly ignored the content of my letter and instead outlined the technical details of parking regulations and clamping with which I have no quibble”. Natural justice demands a thorough understanding of the circumstances of an incident before any guilt can be attributed in this manner. Moral actions are conducted by human beings, thus the human circumstances involved must be taken into account before guilt is attributed or penalties imposed. The complainant also asked what would have happened to the elderly woman if she had not stepped in. A note on this complaint also reads, “Refund with caution, gesture of goodwill”. Head of Advocacy and Communications with Age Action, Justin Moran, told TheJournal.ie, “I’m not surprised to see complaints from older people about a payment system so reliant on credit cards or online payments. The majority of people over the age of 65 have never been online, let alone carried out their financial business using the internet, and many prefer to deal with their business in cash. Email “Clamping complaints: Elderly woman with no mobile or credit card clamped while at mass”. Feedback on “Clamping complaints: Elderly woman with no mobile or credit card clamped while at mass”.